Watch your backs, Girl Scouts. This was way ahead of your time, Mrs. Fields. Apparently, the YWCA ladies can bake a pretty mean cookie. It is highly unlikely that the Downtown YWCA’s recipe for chocolate-chip cookies will ever be revealed. But that doesn’t stop people from asking. Or from trying to reproduce it. The popularity of the cookies has fended off competition from Famous Amos and the Famous Amos knock-off called The Famous. But a cooking teacher in Arlington took up the chocolate-chip cookie challenge two years ago when the Y re-buffed her request for the recipe. This teacher, a Mrs. Carol Finkelstein, spent two years trying to recreate this famous recipe — at one point, the article says, she even considered taking the YWCA cookie to be analyzed by a lab. But if this cookie is so legendary, why haven’t I heard of it? Famous Amos, sure. Toll House, of course. The Neiman Marcus urban legend, yes. 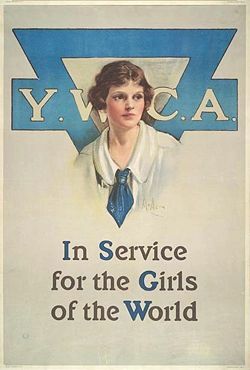 But I’ve certainly never been to a YWCA or a YMCA and discovered cookies so good they prompted a two-year quest for the recipe. I was so perplexed I e-mailed the PR coordinator for the YWCA in Washington, D.C. Apparently, my ignorance was so profoundly idiotic that it didn’t warrant a response. So I stepped up my online investigation. The National Capital Area YWCA recently held a YWCA cookie bake-off, in the spirit of those great original cookies. Again, though, this article assumes I already know the wonder of the cookies! The article goes on to explain that thousands of these cookies were sold from one YWCA in ONE DAY. Barbara Bush and Sandra Day O’Connor are apparently big fans. But this is the only non-newspaper place where I can find mention of the “famous” treat. Frankly, the Post and the New York Times seem borderline obsessed with them. This Post article provides a pretty good history of the cookie, which was baked by the same four women from 1951 to 1981. I think a large part of my intense curiosity surrounding these cookies is the fact that I am so perplexed that something treated as common knowledge in several articles was so totally foreign to me. Reporters constantly struggle to walk the line between making sure their readers have all the background information they need without making the article sound like they’re talking down to readers. And what will happen in the future, when people forget that “tots” is a reference from Napoleon Dynamite and Brittany and Paris are no longer household names? When I first thought about this, I figured it wouldn’t be a problem people could go to Wikipedia or the Urban Dictionary to track down dated references. But if the YWCA cookie is so completely erased from most circles of pop culture, isn’t it inevitable that this will happen to some degree even in our time? And as for the recipe? I spent too much time researching this weekend and not enough time baking. Check back in a day or so!